Big Screen Experience - 7 Inch LCD touch screen tablet provides a crystal clear image and real-time video. The IPS display allows you to watch from multiple angles without distorting the picture or affecting the color. 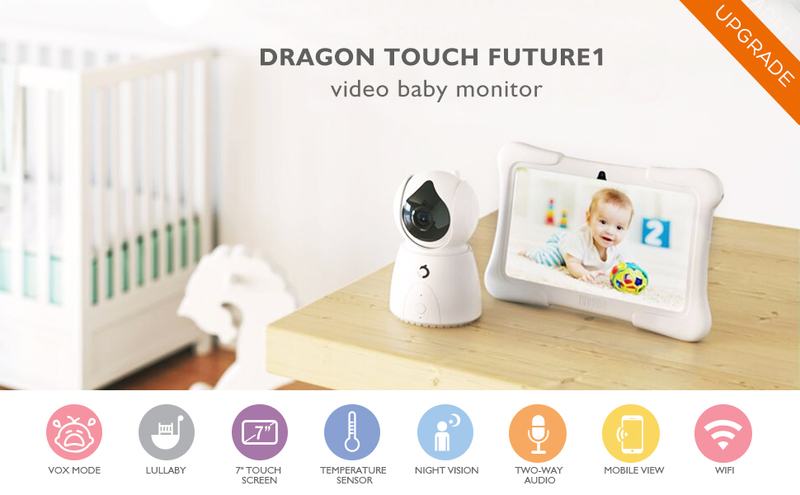 Dual-Way Wi-Fi System - Unlike other video baby monitors, the Dragon Touch Future 1 baby monitor supports mobile and tablet to monitor simultaneously. The secure 2.4GHz FHSS wireless transmission provides 100% digital privacy and password-protected WiFi connection, allowing you to monitoring your baby from anywhere, whether you are at work or traveling. 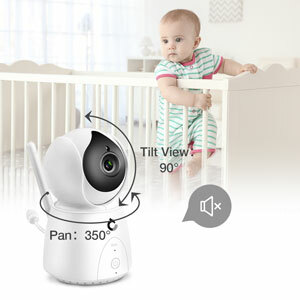 720p HD Remote Pan / Tilt Camera – The Future1 video baby monitor with its 1280 x 720 high resolution megapixels camera delivers real-time monitoring. When the 105° wide-angle glass lens is combined with the 350° horizontal and 90° vertical rotation range it creates a complete 360° coverage. Enhanced Two-way Audio – This system allows you to comfort your child with clear and sharp sound. The temperature display on the screen ensures your baby remains comfortable and safe. By buying this product you can collect up to 139 loyalty points. Your cart will total 139 points that can be converted into a voucher of $1.39. 7" Touch Screen - 7 Inch LCD touch screen tablet provides a crystal clear image and real-time video. Infrared Night Vision – This night vision offers crystal clear video in white & black. Meaning you can see your little ones at night without having to leave your bed. Wi-Fi Connection - connect this camera to your own cellphone or tablet via 2.4GHz Wi-Fi. Audio mode – Is the screen too bright at midnight? Is the alarm too loud? Simply cancel the alert mode and press the power button on the monitor to turn the screen off. The monitor will continue to detect sound around the camera even when the screen is off. VOX Mode – It is not necessary to have the tablet on throughout the night. Turn it off and get some well-deserved sleep. 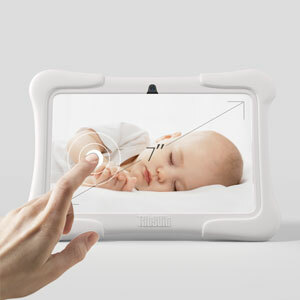 If your baby begins to stir, cry or make any noise the tablet will automatically be activated and will wake you. Remote Pan / Tilt Camera - 105° wide-angle glass lens combined with 350° horizontal & 90° vertical rotation range creates a complete 360° coverage. Two-Way Talk - Talk back to your baby via the intercom. Temperature monitoring - Remote in-room temperature display lets you know your baby is comfortable and safe. 5 Lullaby - With 5 pre-programmed lullabies, the Dragon Touch Camera can sing your baby to sleep.